Paradise Designs | Are you considering Maintenance for your yard? 26 Sep Are you considering Maintenance for your yard? After a long hot summer your yard may be showing the wear and tear of prolonged scorching days. Consistent quality maintenance can help. Just like a good Spring cleaning, a Fall tune-up and regular landscape maintenance service can spruce things for the holidays, as well as the cool, windy and hopefully rainy days to come. Over the years we have talked to a lot of clients about why they use our services. Today, we’ll talk about why our customers hire us to care for not just their lawns but their entire yards. The vast majority trust in our 30+ years of experience and consider our staff more knowledgeable about what the needs are to keep lawns and landscapes looking beautiful all year long. We are proud of our hard-earned knowledge. It gives us the opportunity to provide results that will be more lasting and beautiful than you may be able to achieve on your own. For instance, the cycle for aerating and fertilizing your lawn. As an example, this time of year calls for seeding, applying fertilizer and adjusting irrigation to improve areas of the lawn that may be suffering from the summer’s heat. 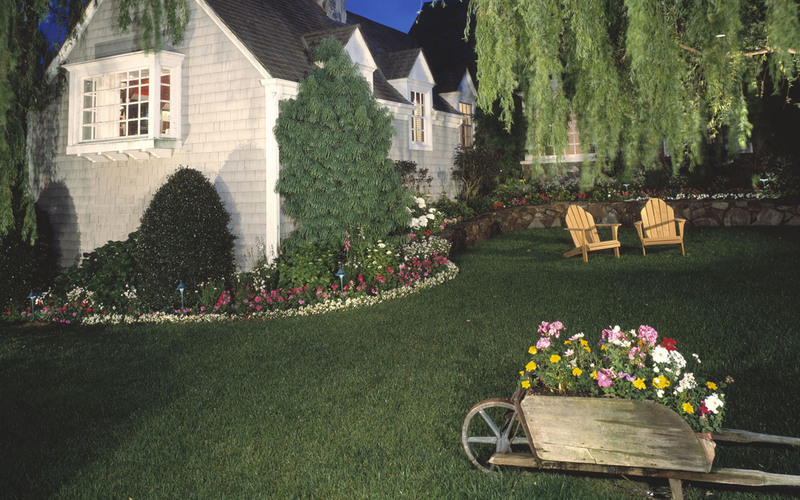 We have been tending our client’s lawns and landscapes since the 90’s. Making sure we use the proper fertilizers, in the right amounts, at the appropriate times of the year, is a big part of what we do. Not only do we strive to keep your lawn green, we work to ensure we use the optimal amounts of seed, weed & feed, fertilizers and other maintenance products with a balanced approach in order to keep an eye on environmental balance. If you fall into the category of homeowners’s who don’t want to do the work themselves, have tried and tired of the consistency required, or are just to busy to devote the time that landscape maintenance requires, we are here for you! This also holds especially true if, for some reason, you have health issues keeping you from doing yard work. It’s our job to do that work and we are happy to show up and keep your landscape clean, trimmed and groomed. Not only do we mow, edge and blow but we keep your flower beds tended, shrubs trimmed and trees pruned. Just let us know what level of service you seek based on weekly or bi-weekly man hours and we can do it. Our staff is proud to be more than just a mow and blow service. We provide a complete landscape management service with seasonal adaptations based on our geographical location, climate and needs. Our commitment to the best service and the most stunning yards has kept us delivering our version of paradise to homeowners day in and day out, week in and week out. Do you have questions about what we can do to keep your yard tended and free up your weekends for fun and frolic? Give us a call or email us! We would be happy to meet with you and give you a quote.